Bulk-Flow is a bulk packaging engineering and manufacturing company established in 2007, but with over 20 years of combined experienced, specialized in container liner bags for the shipment of dry flowable solids in marine shipping containers. Bulk-Flow has a wealth of expertise handling all type of containerized commodities: petrochemicals, agricultural, minerals, pharmaceuticals, etc. It has a particularly outstanding record in handling those hard-to-flow commodities such as flours, starches, cement,TiO2, carbon black, and others, with its patent pending flat fluidizer container liner bag. Other proprietary designs (patented) include the company’s bar-less container liner bag that does away with the use of expensive steel bars used for bracing. This solution is particularly cost effective for those shipper of dense commodities that require six to eight steel bars to brace the load. 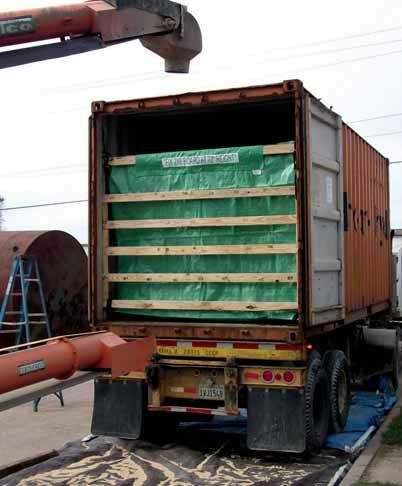 Bulk-Flow’s bar-less container liner bag is an extremely safe liner during loading, transit and unloading. Although the bar- less liner is sufficiently strong to be unloaded (tilted) without the use of steel bars, the bar-less liner is the only bar-less in the market that allows the addition of steel bars prior to unloading, as a redundant safety measure. The company therefore confidently claims that its liner is the safest in the industry. Despite being a design absolutely proven since 2008, the bar-less liner’s general market penetration is not mainstream yet, due to the large economic interests that the receivers of the loaded liners have, to re-sell the steel bars of the traditional liner bags, in the secondary used steel bars market. Bulk-Flow hopes that, at some point, this inefficiency in the market will be removed as it is not justifiable in the overall cost scheme. Nothing about Bulk-Flow is standard though, and even in its offer of traditional liner bags that require steel bars, the company has not followed the same course as its competitors, and it has made radical changes in the way it manufactures its liners, its material selection and its components. It is truly a liner bag unlike anything in the market in terms of installation, loading and unloading performance, and the ability to protect the cargo from spills and spoils. This might sound like a familiar claim from any liner manufacturer, but Bulk-Flow is truly an engineering company, and it has looked very carefully at all aspects of liner bags. liner bags are so much more than just bags — they are highly engineered flexible packaging materials that will ensure the commodities can be reliably shipped in bulk inside of a container. Proof of how much the company engineers its products for performance and cost is the continuous amount of new products it puts out to the market. Bulk-Flow might not be the leader yet in terms of sales volume, as it is still a relatively young company, but its Fortune 500 customers are keen to acknowledge its technical capabilities. Some of Bulk-Flow’s latest innovations include its plastic grain doors. This item potentially has the greatest impact of all its bulk packaging solutions, in terms of the amount of shippers it can serve: increasingly large amounts of agricultural commodities are being containerized, and typically contained at the door with just a combination of wood boards and cardboard. The shipper might not see the issues with such setup, but the end-user definitely does. If the cardboard absorbs too much moisture from the sea or from the commodity itself, it will be rendered useless, and all the weight of the product will collapse onto the container doors, thus building up a lot of pressure on those doors. This poses a risky situation known by the receivers, that are forced to deal with it, by carefully opening the doors of the container with a forklift standing behind to contain a potential violent opening of the doors injuring an operator. Even in those instances when the cardboard has kept its integrity during the journey, it is not an easy material to slit and allow the outflow of the product, since there are several cardboard sheets together — it involves pushing hard with a knife or other cutting tool, another potentially high risk situation for the discharge operator. Bulk-Flow’s plastic grain door will not be affected by the moisture guaranteeing its integrity, it is very easy to slit, and very importantly too, it always installs in the same way, unlike those traditional grain doors and boards which do not have any standard in terms of the number of cardboard sheets or wooden board pieces they use. Bulk-Flow believes that, as end-users are exposed more to its plastic grain doors, they will realize that there are much better solutions out there, that they don’t have to resign themselves to the low performance of the traditional grain doors, and that they don’t even have to pay more for it, as it is cost competitive as well. Bulk-Flow’s liner bags for container reefers also demonstrate its high packaging engineering capabilities, though these are for a much smaller market. The challenge resides on being able to properly install and secure a liner bag in the flat walls of reefers, that also lack any anchoring point. After several tests Bulk-Flow succeeded, and now it can greatly decrease the re- positioning cost of any container reefer, by eliminating its empty back-haul, and instead converting it into a bulk vessel for any dry bulk flowable commodity. Bulk-Flow strives to avoid complacency, and is confident that it will continue to develop more bulk packaging solutions in the years to come, as supply chains for bulk commodities push for reducing operational and packaging costs.